Fine art has often been portrayed on playing cards, usually as a card back design but, occasionally, on face cards as well. We've put together a list of examples of artists whose work is represented on playing cards and tarot cards, and hope to continue to add to this list as our researches continue. 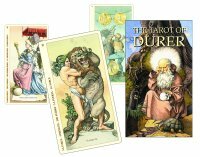 Tarot Cards - Tarot symbolism is a tempting theme for some artists. Durer Tarot - Not really done by Albrecht Dürer, but in the style of Dürer. Salvador Dali Universal Tarot Cards - A $100 tarot deck. Impressive, eh? But good art doesn't come cheaply . . . Actually, now that it is out of print, a deck in new condition sells for three or four times more than $100 . . .